When you move your cursor over any list item, a border appears around the item. This isn’t a difficult effect to achieve in ordinary CSS but it’s even easier in jQuery. The first is a function to be called when the cursor hovers over the object. The second is a function to be called when the cursor leaves the object. border() draws a border around the current element. The $(this) identifier is used to specify the current object. noborder() is a function that is very similar to the border() function, but it removes a border from the current object. Note that this is still technically a single line of code. Instead of referencing two functions that have already been created, you can build the functions immediately where they are needed. 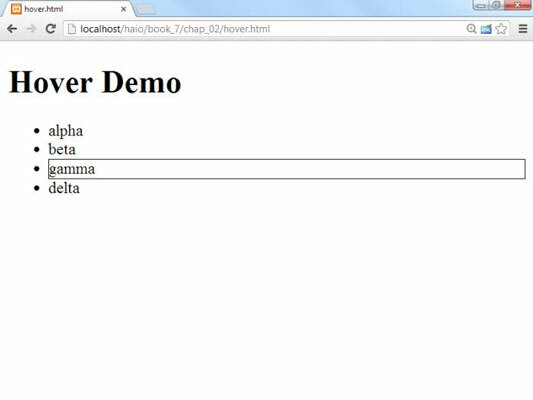 Each function definition is a parameter to the hover() method. If you’re a computer scientist, you might argue that this is not a perfect example of a lambda function, and you would be correct. The important thing is to notice that some ideas of functional programming (such as lambda functions) are creeping into mainstream AJAX programming, and that’s an exciting development. jQuery supports another wonderful feature. You can define a CSS style and then add or remove that style from an element dynamically. Begin with a basic HTML page. Create a class you want to add and remove. You can build a CSS class called that simply draws a border around the element. Of course, you can make a much more sophisticated CSS class with all kinds of formatting if you prefer. Call the toggleBorder() function whenever the user clicks a list item. The init() method simply sets up an event handler. Whenever a list item receives the click event (that is, it is clicked) the toggleBorder()function should be activated. The toggleBorder()function, well, toggles the border. addClass() assigns a class to the element. removeClass() removes a class definition from an element. toggleClass() switches the class (adds it if it isn’t currently attached or removes it otherwise).